The Toyota Land Cruiser is like a retired boxing champ: It used to be rough and tough, but now it’s just bathing in luxury. What do you need to know before you buy a Land Cruiser? Don’t worry, we’ll tell you everything right here in our Buyer’s Guide. The Toyota Land Cruiser has an epic history. Developed in the early 1950s and based off the design of the Willys MB Jeep, the Land Cruiser was Toyota’s first off-roader. After rigorous off-road testing including a trek far up Mount Fuji, the Land Cruiser entered the Japanese market in 1954. It wasn’t until 1958 that the Japanese off-roader came to the U.S., and when it did, it quickly became the best selling Toyota for five years straight. But the modern day Land Cruiser is nothing like the old FJs, because in 1965 the Land Cruiser started getting soft. That was the year that the five door station wagon Land Cruiser joined the party, bringing more of a “comfort” factor to the rugged SUV game. After a few years, Toyota killed off the two door, leaving us with what Toyota calls “a luxurious bridge between civilization and adventure.” So basically a giant luxo-barge that you could take off-road, but you’ll probably wind up just taking it to your country club. The current generation Toyota Land Cruiser has been bouncing around American streets since the 2008 model year, when it launched on a new J200 platform with a new interior, new styling, a 5.7-liter V8 engine, a six-speed automatic transmission, a fresh new suspension, larger dimensions and much more tech like Kinetic Dynamic Suspension System and Crawl Control. 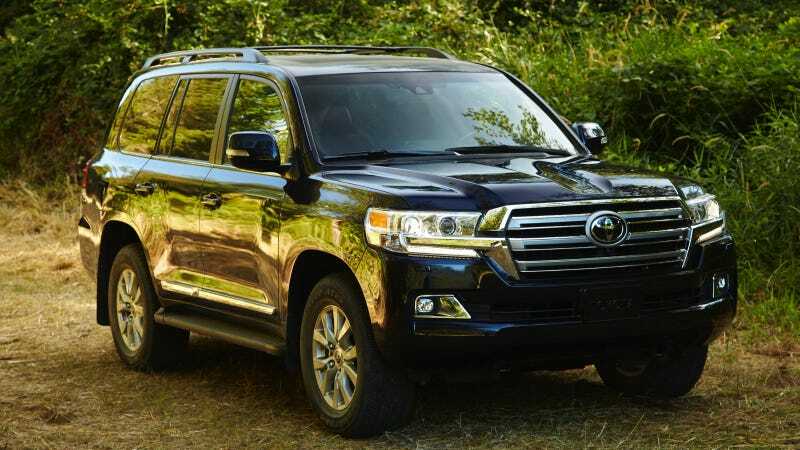 The Land Cruiser sat on the sidelines for 2012 and returned to the U.S. market as a 2013 model with significant changes. Optional content all became standard, so from 2013 on, the Land Cruiser came only in decked-out form. The ‘13 brought a new fascia, new HID headlights, new taillights, new wheels, new seats, a fresh navigation system and other changes to the instrument panel. Now for 2016, the big off-roader gets new styling front and rear, an eight-speed automatic transmission and a new Safety Sense package, which includes Frontal Collision Avoidance, Frontal Collision Mitigation, Lane Departure Alert, Auto High Beams and Dynamic Radar Cruise Control. There’s also a new blind spot monitor, rear cross traffic alert, nine-inch infotainment touchscreen and revised center console. New interior leather options make appearances for 2016, as do Qi wireless charging and a Siri Eyes Free infotainment option. And of course, it’s all standard, because the Land Cruiser doesn’t do trim levels or option packages. All models get hydraulic power steering, a double wishbone design front suspension, a four-link rear axle setup, Kinetic Dynamic Suspension System, 13.9-inch vented front rotors and 13.6-inch rear discs. We wouldn’t drop over 80 grand on a luxurious old-school SUV, but if we had to buy a Land Cruiser, we’d buy the base trim. Because it’s the cheapest, best equipped, and best performing trim. But mostly because it’s the only trim. That’s right: the Land Cruiser comes as a single trim and is completely decked out with automatic on/off auto-leveling HID headlights with washers, rain-sensing wipers, 18-inch alloy wheels, skid plates, four-zone automatic climate control, multi-terrain monitor camera, 9-inch displays for rear seat entertainment system, eight passenger leather seats, power heated and vented front seats with driver memory, leather trimmed heated power tilt/telescoping steering wheel, power tailgate, navigation, 14-speaker audio system, 8-inch touchscreen, full-time four-wheel drive, locking center Torsen differential, Kinetic Dynamic Suspension System (adjustable and disconnect-able sway bars), Crawl Control (off-road cruise control), Multi-Terrain Select (selectable off-road modes), Pre-Collision System (detects objects in front of the car and warns driver) and front and rear parking assist. That’s a lot of kit, but at $84,820 after destination fee, that’s also a lot of coin.